How Do You Use a Feather Duster? I’ve written before, and this may be a silly question, but I have been wanting to buy the duster for sometime, but am limited on my budget.I hate to dust. It was always something I was forced to do because my mom hated to dust. I want to make if fun for both me and my kids. I just don’t really know the first thing about feather dusters as I was always made to use Pledge and a rag.Any feedback is welcome. We all know about being forced to dust the way our mother’s wanted us to do it! We do not have to dust like our mothers did! We can do it our way! Feather dusters are an amazing tool that helps us to have fun, and at the same time, get the job done! They don’t just move the dust around, they pick it up with all of their thousands of tiny feathers. Each plume is made up of these little feathers. They do all the work, so you don’t have to! I like to hold my duster as if it were a pencil! Then, with little quick flicks of the duster, the feathers surround the items on your tables and pick up the dust so you don’t have to pick up the item. Did you know that dust does not get under the items on your tables, just around them? If you use your duster every day, you will never have to see dust again. Isn’t that what our routines do for us?! When we develop habits, our homes clean themselves. Just a few short minutes in the morning and then in the evening along with picking up after yourself and your house can be on automatic pilot too! 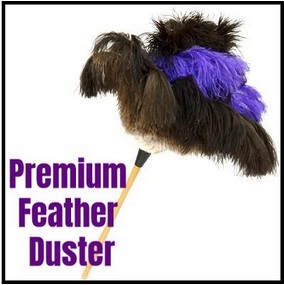 Our new FlyLady Feather Duster is a great tool to help you bless your home. Head on over to the FlyShop to purchase yours while you can still save 15% with coupon code Pumpkin15. FlyLady here: Our dusters really do work. They were tested on sheet rock dust. I have been using mine today. It only takes me a couple of minutes to feather dust our whole home. Our newest duster is the most luxurious feather duster since our original duster. The only difference is this one has a few purple feathers. Use our Coupon Code PUMPKIN15, it will expire soon! Don’t procrastinate! This entry was posted in Ask FlyLady and tagged ask flylady, feather duster, flylady, organized. Bookmark the permalink.